Seven rich skin-loving oils make up this complexion bar recommended for dry and devitalized skin Evening Primrose has been used in folk medicine for its skin soothing properties and to help with dry skin, eczema, scaly skin, and dandruff. It is rich in vitamins and minerals and is a rich source of essential polyunsaturated fatty acids which promote healthy skin by conditioning and restoring moisture to dry or rough areas.This bar is also enhanced with grapeseed oil infused with annatto seed which adds the rich sunny color! This staple bar is what I call my 'emergency bar.' Whenever you encounter conditions where the water quality decreases or if your skin just starts acting up due to a climate change or some other change, this bar will set everything straight. It's so nourishing it's healing (literally), and you'll be back to normal in no time. Grab 1, 2 or 3 of these and your family (and skin) will thank you! I received a generous sample of this soap, and it was so wonderful for my face. I'm very much an adult, and yet I still get some breakouts; none of the harsh acne soaps or lotions have helped, they only dry out my skin. 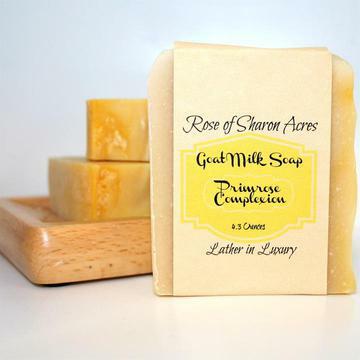 This soap is so lovely and moisturizing, and if I made sure to use it every day, my skin became flawless! After my sample ran out, my skin suffered. So I am so glad to be stocked up again! A little went a long way, so this bar is going to last me a long time and is a wonderful value. After only three days of using this, my skin is improving. My face is terribly dry and over the years I have wasted MANY of money on different cleansers and moisturizers, but nothing really worked. So far this is very promising. My skin feels hydrated and the flaky patches are shrinking considerably. My face actually feels touchable right now. The bar is quite large so it will last for a bit. I am not crazy about the scent, but that is just a personal thing and I can easily overlook it after seeing what it does for my skin. Thank you! Thank for the GREAT bar! I do not need a toner nor a moisturizer anymore. This is the greatest thing I have ever used for my face. I have mild rosacea and it helps with it also. Thanks for making a great product. This face soap leaves my skin feeling clean, smooth and soft. I am in my forties and have very sensitive skin. This soap works better for me than any facial cleanser I've used. And, I have spent a lot of money on pricey facial cleansers. This soap is all I need. It doesn't break me out nor does it dry my skin out. It takes off all make-up leaving a wonderfully clean feeling, and it gives the perfect amount of moisture to my skin. I highly recommend this wonderful facial soap. I've been using your products for some years now, and am happy with all of them. My 18 year old daughter even began to ask me to re-order things for her! This year, she's been stealing my goat soap for her face. The other day she was on her way out the door on a weekend trip, and panicked because she didn't have any soap! We ended up cutting my bar in half to take with her. A great compliment to you! I was a little nervous about using a bar of soap on my face since it's so dry, sensitive and reactive, but after just one use I think I'm hooked. It didn't dry out my skin at all. I've tried other natural soaps that promise to soothe my dry skin, but after I use them my face is so tight and dehydrated. The lather was nice and I really enjoyed the smell. But mostly I liked how my face felt and looked when I got out of the shower. Love this bar! My first one to try. The lather is very soft and luxuriously cushiony! Does not irritate my sensitive face at all! Removes makeup extremely well. Moisturizing, but not in the way that makes you break out if your skin tends to be on the oily side. highly recommend! Ultra moisturizing cream formula - say goodbye to alligator skin. Great for rough feet and dry hands also. 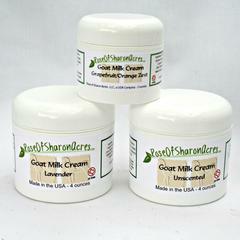 Great for Mature or Sun Exposed Skin!